No, there’s nothing inaccurate about that headline. Strange and hard to believe? Yes. Especially when you consider the scholars I’ll discuss, I’m sure, have never heard of Kayla’s Playground or my neighbors. That wouldn’t matter to the two Canadians. What the playground and my neighbors have done (and thousands of others) has pushed the scholars to start a worldwide campaign. This past weekend our family paid a visit to one of our favorite Franklin destinations: Kayla’s Playground. Kayla’s Playground features a Little Free Library. My neighbors who live three doors away also have one up near the curb on their front lawn. Those neighbors of mine are part of a booming movement. Little Free Libraries can be found in every state and in more than 70 other countries totaling 50,000. More are going up daily. Sounds rather commendable. Who could possibly be upset and disagree? Jane Schmidt, librarian at Ryerson University in Toronto, and Jordan Hale, an original cataloguer and reference specialist for the University of Toronto.“There was something that kind of irked me about the title,” said Schmidt. “As a librarian, my gut reaction to that was, ‘You know what else is a free library? A regular library.’”Schmidt and Hale wrote a recent article describing research they did about those tiny libraries and why they want to put an end to them. Their opposition was also the subject of a lengthy piece on CityLab earlier this month.According to Schmidt and Hale’s research that centered on Canadian cities Toronto and Calgary, they only noticed Little Free Libraries in Toronto’s wealthier neighborhoods.They concluded Little Free Libraries are found where public library branches are plentiful and where neighborhoods are white.While they concede their case study only took into account two cities they contend their findings confirm their suspicions about the organization:We submit that these data reinforce the notion that [Little Free Libraries] are examples of performative community enhancement, driven more so by the desire to showcase one’s passion for books and education than a genuine desire to help the community in a meaningful way. Schmidt and Hale claim you’ll discover the libraries in abundance in hyper-educated, affluent, crunchy blue enclaves across the country where residents tend to wear their progressivism on their sleeves. Apparently my neighbors are a rare exception. Let’s bring in Todd Bol. In 2009, Bol of Hudson, Wisconsin, built a model of a one room schoolhouse. It was a tribute to his mother; she was a teacher who loved to read. He filled it with books and put it on a post in his front yard. His neighbors and friends loved it, so he built several more and gave them away. 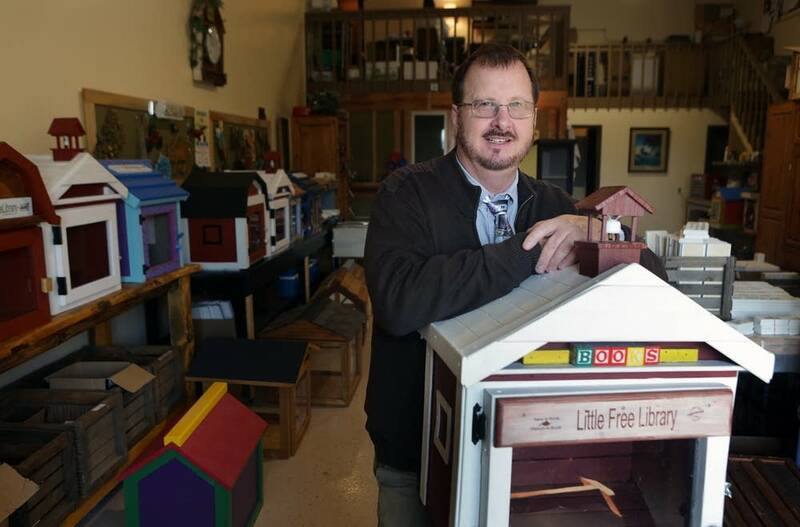 Bol is the co-founder and executive director of Little Free Libraries. “What happens is, somebody reads about us. They hear about us. And likely, who hears about us is a great champion of books and literacy. They put one in their neighborhood. They put one out their front door. Their neighbors put one in. That has a tendency to be a higher-echelon neighborhood. On that she is soooo right. Instead of crapping all over Little Free Libraries, why not work with Bol’s group to expand them into more areas and benefit more folks? We know Schmidt and Hale know how to do research. Put that expertise to an enriching campaign. Nobody finds Colson Whitehead’s The Underground Railroad in a Little Free Library—much less Wi-Fi, college counseling, or jobs services. A well-funded library system has little to fear. Hope you’ll read that long CityLab piece. There’s some delicious irony. Turns out librarians actually love and have given awards to the libraries. A final note about Kayla’s Playground. Their Little Free Library looked nothing like the above picture when we visited over the weekend.